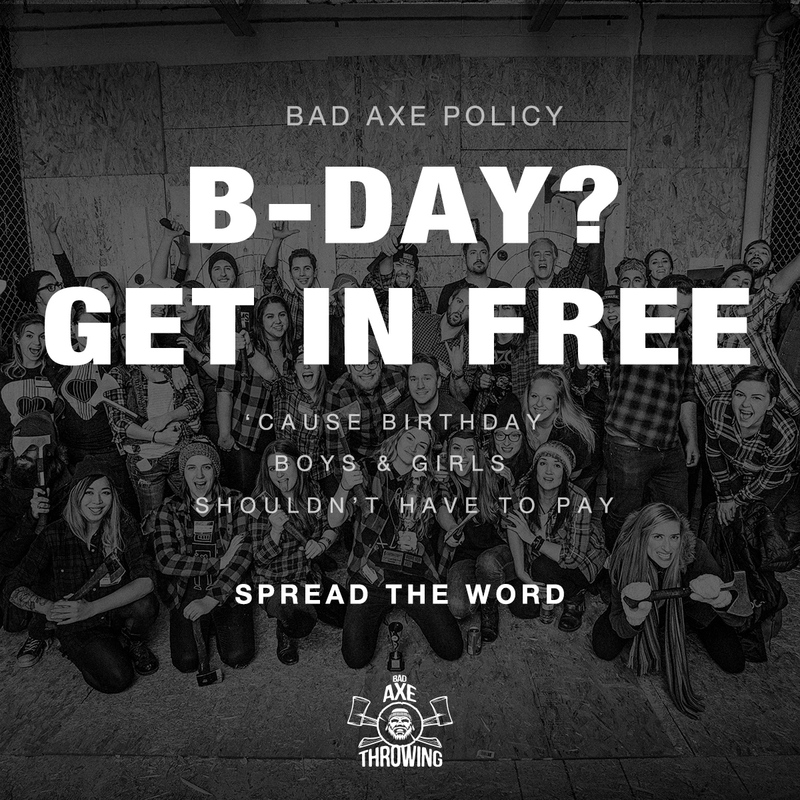 We’ve got a new Bad Axe Throwing policy in place: FREE AXE THROWING on your birthday. That’s right, we’ve decided that if it’s your special day, you shouldn’t have to pay a dime. We want to make your birthday that much more memorable! Celebrate your birthday at any Bad Axe Throwing location and you don’t have to pay a cent. Just show your ID. 1 free birthday pass can be provided after each required minimum quota of payments is reached. If the minimum booking requirement at your location is 8 then 18 guests means 2 free Bday passes because 16 payments will be made. 27 guests would mean 3 free Bday passes and so on! Birthday Promo does not apply to Walk-ins, it’s for private events only – No exceptions. The birthday free pass is applicable only if the birthday is within 7 days of the scheduled event. We also just recently launched our online apparel store where you can add to your birthday experience. If you want to wait, we also carry the same apparel selection at all of our locations. To get in for free on your B-day, all you have to do is book your event as you normally would online or through a customer service representative. Just remember to email us more than 48 hours before your event, a valid government issued ID (driver’s license or passport) so we can validate your birthday is within 7 days of your event & your admission will be free. On the day of your event, simply show your ID and once the required minimum payments for your event are reached you won’t pay a cent! It’s our way of saying Happy Birthday… by giving you a free axe throwing experience with us!